T3Desk is a professional-class application that keeps you organized, makes you more productive and improves the way you work with Windows and the Web. 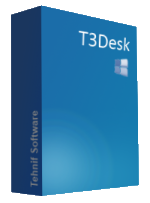 T3Desk implements a lightweight 3D Desktop Module, Windows manager, Applications manager, among other powerful, flexible and easy-to-use features and tools, to ensure your seamless desktop and online experience. Required Operating System: Windows XP/VISTA/WIN7 and later versions. Required Components: GDI+ and Visual C++ 2012 runtime components to be installed. All mentioned redistributable packages are already installed on your computer or free to install from Microsoft Download Website. T3Desk received great reviews from the industry press. T3Desk received great awards from on-line software portals. PAD is the Portable Application Description for webmasters and program librarians to automate program listings. Click here for PAD file. And here is a TEXT file containing the current version.